The Thursday night summer concert series has begun at The Kemah Boardwalk, 215 Kipp Ave. Rock The Dock bands play at the stage located by the fountains at 7 pm – 10:30 pm. Bring your lawn chairs to relax and enjoy the tunes played by popular local groups from the Texas Coast. The concert series continues through August 27th. 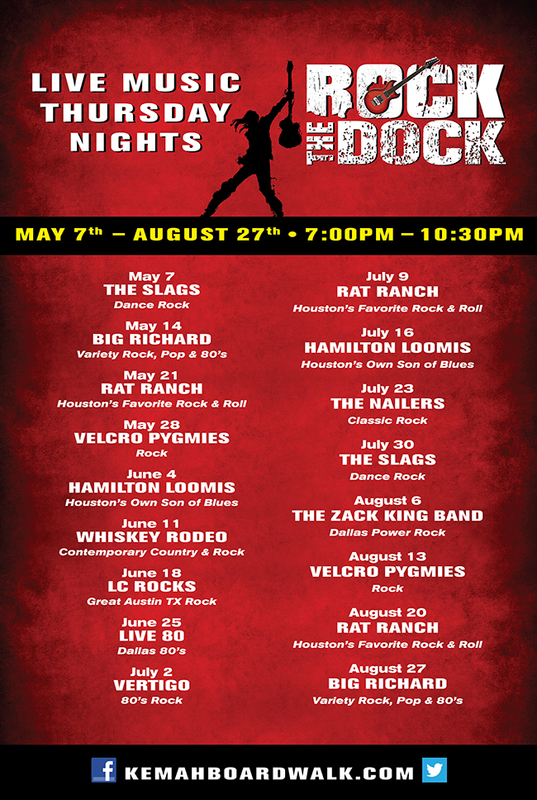 For information about who will be playing at Rock The Dock, visit the Boardwalk’s website, or call 281.535-8100. There is no charge to enjoy the music. Friday Night Fireworks at The Kemah Boardwalk simply means “Enjoy some sparkle over Galveston Bay”. You don’t have to wait for the 4th of July to see fireworks. Every Friday evening during the months of June and July, a fireworks show will begin at 9:30 pm. No charge to bring your family to enjoy the “sparkle”.